Les 7 Doigts de la Main Foundation launches its 2018-2022 fundraising campaign, Guy Laliberté honorary patron. Montreal, February 6, 2018 – In 2018, with the inauguration of its Creation and Production Centre approaching, Les 7 Doigts de la Main Foundation is launching a fundraising campaign. Through its foundation, the collective — who has presented thousands of performances here and abroad — is aiming to raise $5 million over the next five years. To give back to the community by offering creative residencies, artist mentoring, workshops, classes, symposiums and other learning activities. To realize this mission, the Foundation is seeking patrons and donors to help increase the impact of the collective and to contribute to the promotion of the creativity and circus of Quebec. 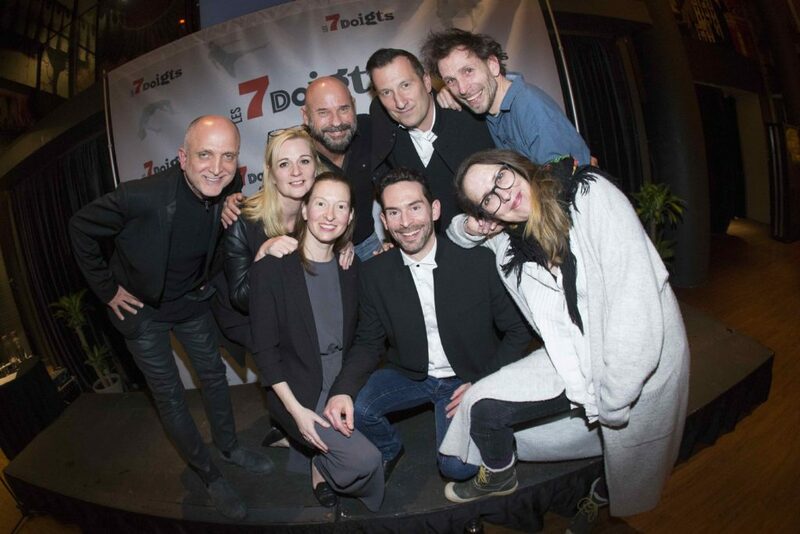 As they launch this fundraising campaign, Les 7 Doigts are thrilled to be able to count on the support of Guy Laliberté, founder of Lune Rouge and Cirque du Soleil. Mr. Laliberté has pledged a major donation of $1 million to the Foundation to support the collective in this new development phase. “This collective is a wonderful example of Montreal’s creativity, shining on both national and international stages. A story of friendship and of passion links me to Les 7 Doigts, who I have been following since their very beginning, 15 years ago. It is vital for me to encourage creation in order to enable the development of art here. That is why it gives me great pleasure to support Les 7 Doigts in the accomplishment of their mission,” he stated. Other donors, including Investissements Québec, Daniel Gauthier, Gilles Ste-Croix, and the Caisse d’économie solidaire have also pledged to contribute to the campaign. “The Caisse d’économie solidaire is very proud to support this excellent project of Les 7 Doigts, in a crucial phase of their development. The attribution of a portion of the collective dividends of our members is one of the contributions we’re making to help endorse a new centre of artistic creation and production, unique in Quebec,” noted Marc Picard, the executive director of the Caisse d’économie solidaire. To date, campaign has raised donations and pledges totalling $1.5 million towards its $5 million campaign goal. “Through various programs, organizations and ministries, Les 7 Doigts have received support from the Government of Quebec, the Government of Canada, and the City of Montreal. It is with humility and great pleasure that today we are able to count on the support of prominent figures from both the local circus world and the business world. The Foundation hopes to bring together seven ambassadors who will join us for a long-term commitment. Each ambassador will be paired with one of the founders for an unprecedented encounter,” said Nassib El-Husseini, the executive director of the collective. The collective was founded in 2002 out of a desire to create a singular circus, a “cirque d’auteur.” This passion has continued to guide all of the group’s productions towards new, more hybrid and more collaborative artistic territories. For 15 years, Les 7 Doigts have been creating and touring their original works around the world and collaborating on numerous artistic projects. They have presented more than 9,000 shows in nearly 500 cities in 45 countries. This year, the collective will inaugurate its Creation and Production Centre in the heart of Montreal’s Quartier des Spectacles, bringing all its activities together at 2111 Saint Laurent Boulevard. Les 7 Doigts de la Main Foundation was established in 2016 and became a registered charity in the fall of 2017. The board of directors is chaired by François Dépelteau. The seven other board members are: Francis Baillet, Éric Batiot, Isabelle Chassé, Nassib El-Husseini, Thomas Lightburn, Danielle Sauvage, and Richard Stursberg. Those interested in contributing to the fundraising campaign are invited to visit the website at Les7doigts.com/foundation.